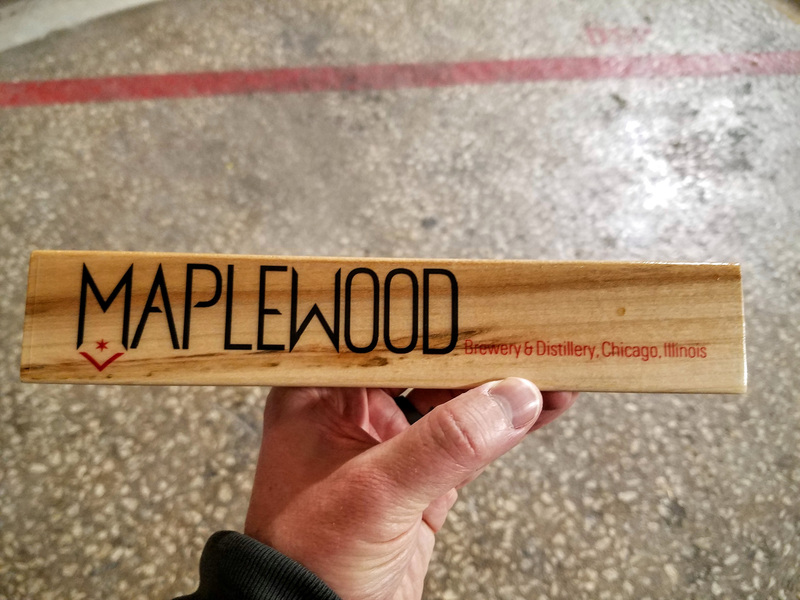 Maplewood Brewery & Distillery sits at the end of a small street in Chicago’s Logan Square neighborhood. The brick building looks industrial and features a Maplewood billboard on the roof that can be spotted from the Kennedy Expressway. The team at Maplewood is small and close knit, consisting of three guys dedicating their time to a shared passion. Founders Adam and Ari have been friends and home brewers for almost a decade. Out of their shared passion they started Maplewood a few years ago and released their first beer in October of 2014. You may already be familiar with Maplewood’s beer, served at bars and restaurants throughout Chicago. Their original and best selling is “The Charlatan” Pale Ale. 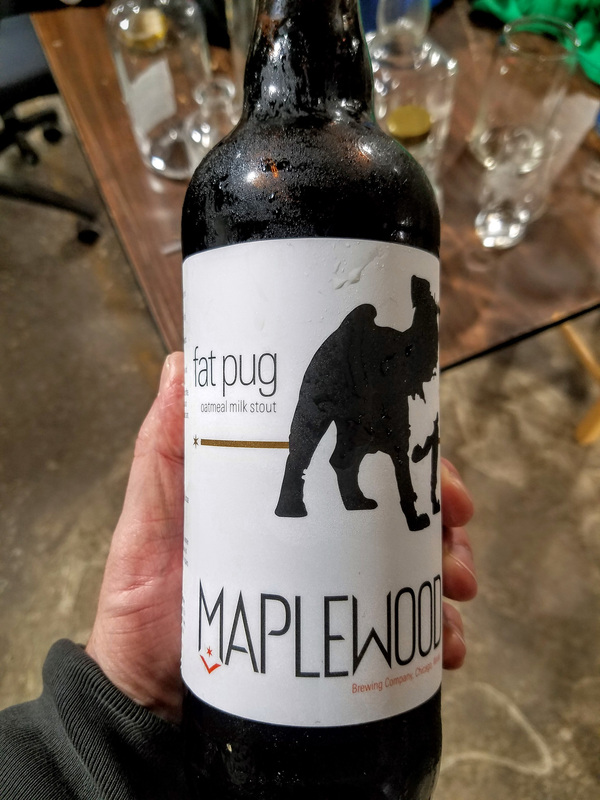 They also produce a delicious Oatmeal Milk Stout with a fantastic name, “Fat Pug”. The name comes from Adam’s dog, Otto, who happens to be a fat pug. A Belgian-style Golden Strong Ale, “Creepy Ginger”, an American Wheat Ale, “Lemon drop”, the “Azacca Morris” IPA, and a Northern English Style Brown Ale, “Bownie Points”. They do a better job describing their beer than we ever could, leave it to the beer nerds within. Check out their website for all of the details. 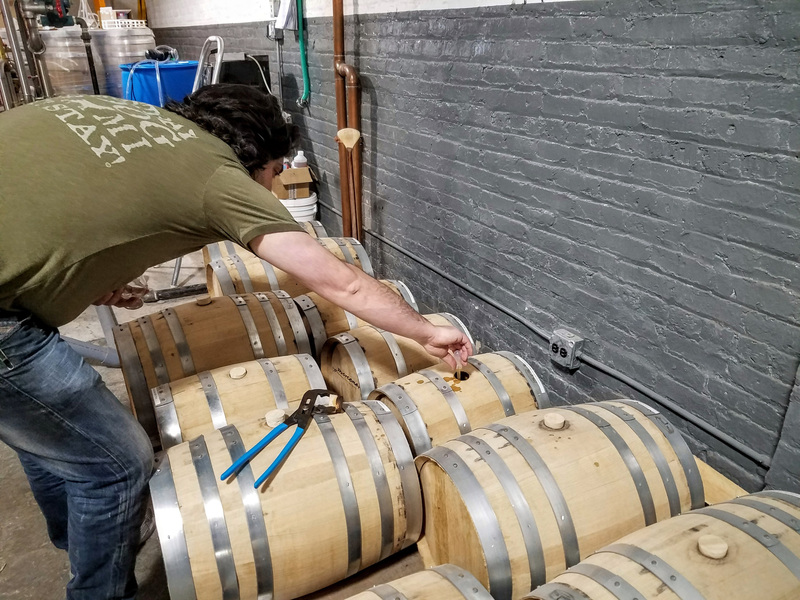 Maplewood is aging some of their beer in first-fill bourbon and whiskey barrels obtained from several distilleries. Bourbon barrels can only be used once to age bourbon. 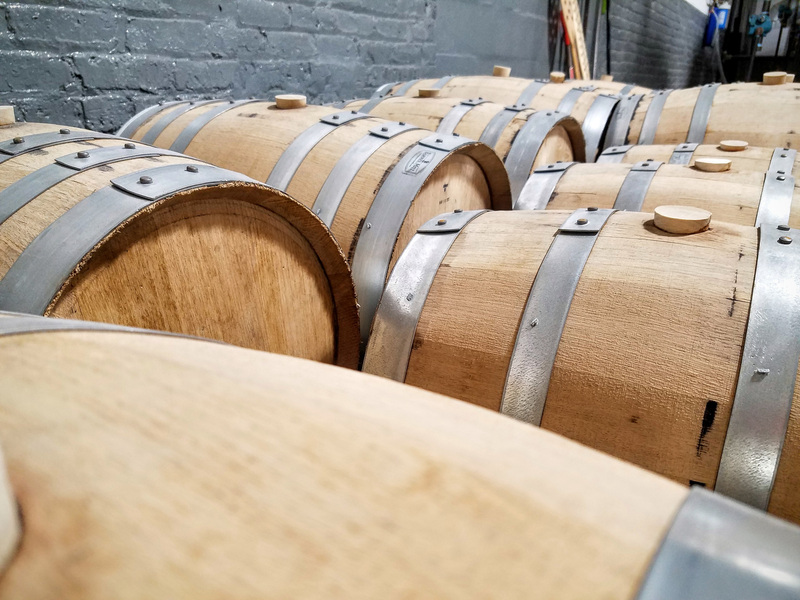 Maplewood takes advantage of these available ex-bourbon barrels which contribute vanilla, sweetness, and other aspects of bourbon. While touring the distillery we spotted barrels from KOVAL (bourbon, oat, rye, and 4 grain barrels), Corsair (aging some of their Fat Pug Stout), and Woodford Reserve. 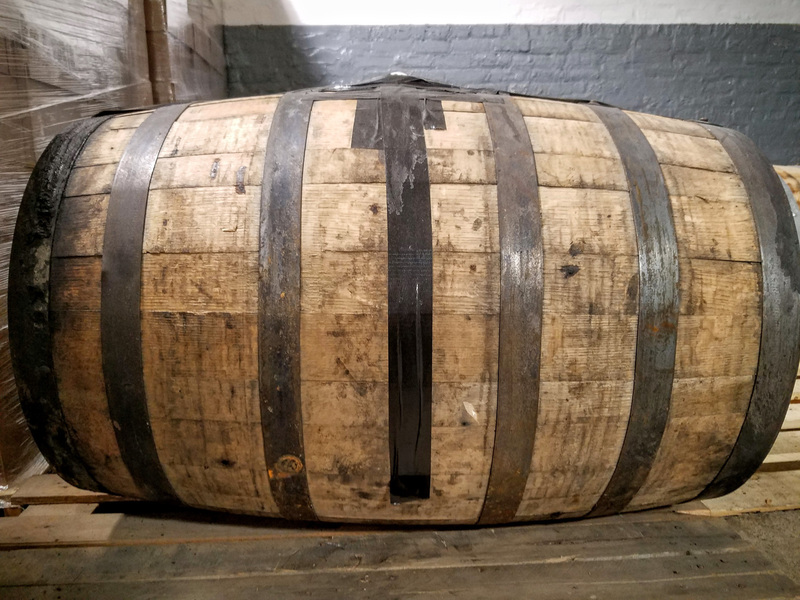 Specifically a Woodford Double Oaked barrel which is sure to add a hefty punch to whatever beer they decide to age in that bad boy. While beer is where it all started, Adam and Ari aren’t stopping there. Last year they added a 250L Kothe column still which sits in the distillery section of the warehouse. Surrounded by barrels the still is currently used to make Gin, Whiskey, and Rye. 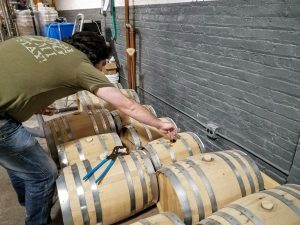 What’s unique about Maplewood’s method is their use of an “off-grain” distillation. 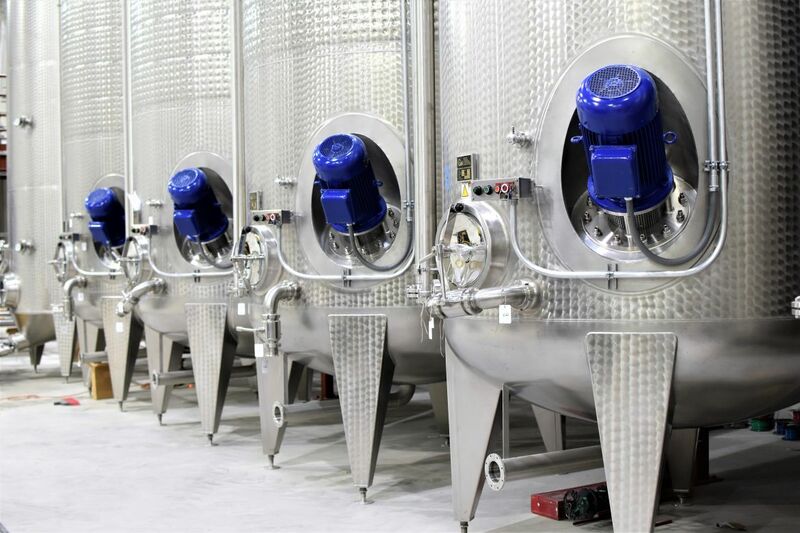 This means they filter the solids from the mash before fermentation. This is common in beer brewing and foreign whisky production and not usually seen in U.S. whiskey distillation. American made Bourbon and Whiskey is almost always fermented “on-grain”, where the mash is pumped straight from the grain cooker to the fermentation tanks, solids and all. 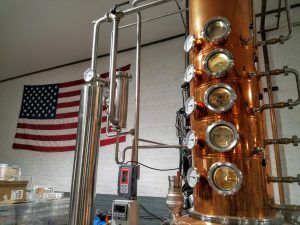 They aren’t currently making a bourbon and are instead taking another queue from their brewing roots and using beer grains for their whiskey mashbills. 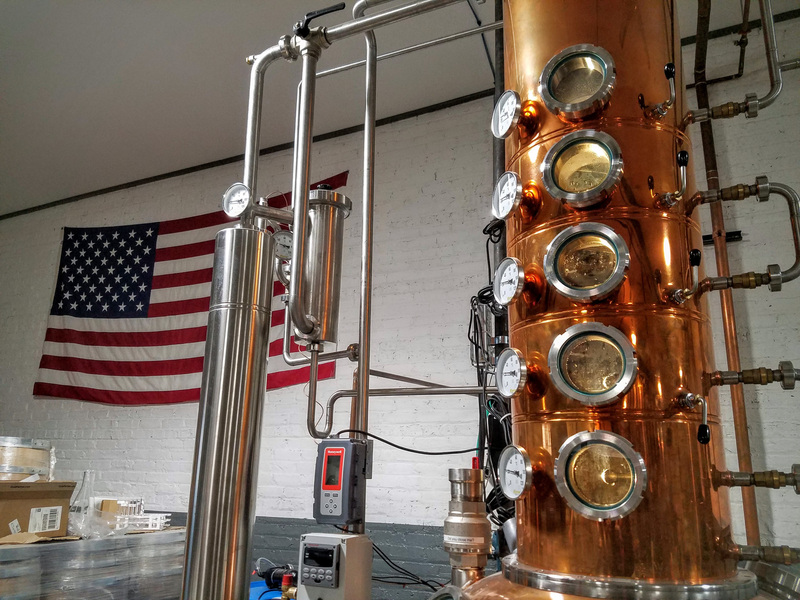 Their Kothe 250L Column Still, gin basket and American flag on the left. Fun fact: The brewing and distilling areas are separated by a thick red line painted on the concrete floor. Founder Ari Megalis pulling us a whiskey sample. We weren’t sure what to expect from Maplewoods spirit methods. So we put their spirits to a taste test! We nosed and tasted several different new makes, the clear distillate before it goes into a barrel. While each had it’s own defining characteristics there were consistencies across them. The nose and palate were round, with a velvety thick mouthfeel. They didn’t burn, or overwhelm the palate and were instead pleasantly balanced. Maplewood’s Stout mash whiskey. New make in the background and aged product up front. We went on to sample two selections of whiskey from the barrel. 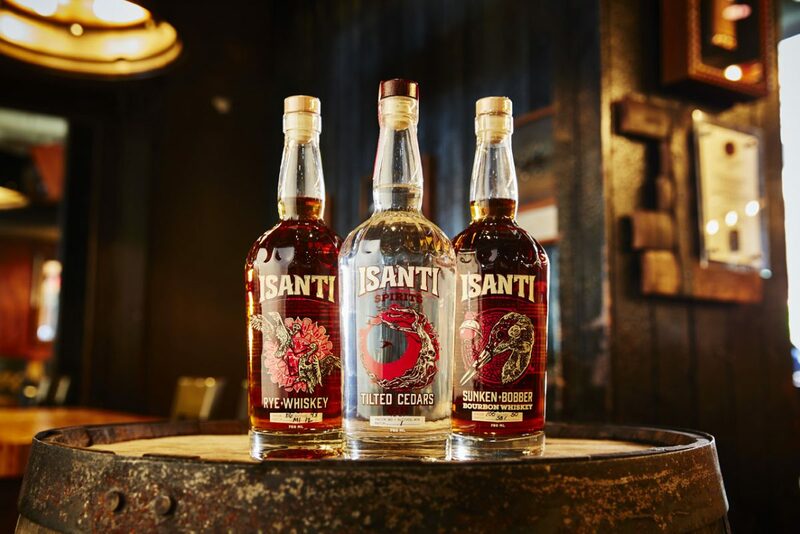 Their spirits are aged in new charred American White Oak barrels from The Barrel Mill and Black Swan. The barrels have either a char #2 or a char #3 and vary in size. They typically use 10 – 15 gallon barrels with an occasional 5 gallon barrel for side projects and experimentation. Recently they aged a Malted Rye in the 5 gallon barrels for a month to see what they would get. The samples we tasted were the Stout mashbill, made with chocolate malts, and the Oat mashbill, made with English style malted barley. 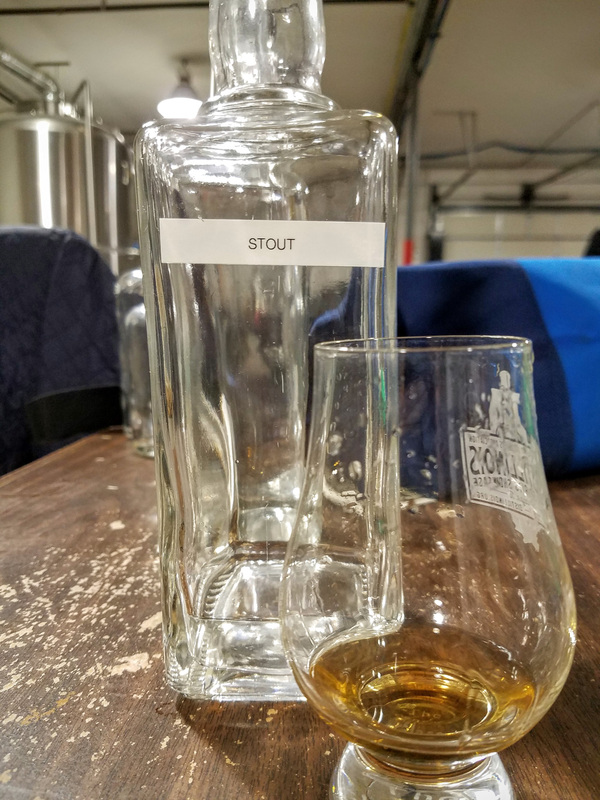 The Stout had been aging 3 months. It started off with a rather sharp nose, that high proof and low age coming through. The palate however was surprisingly smooth, we suspect due to the off-grain distillation. Though still a young whiskey the oak was very much it’s own flavor not yet melded with the whiskey. Ari tells us this will likely age at least another year. Though like most good distillers he says it will be ready when it’s ready. A specific age statement need not apply. Our second sampling was the Oat mashbill. Again we were greeted with a smooth, round, thick palate. Though this one has been aging a bit longer which was very apparent in the complex and balanced profile. We could tell Ari was pleased with the progress of this whiskey, “it should be ready soon” he said. Another upcoming whiskey we didn’t sample is a 100% Rye which they anticipate will be ready around June 2016. Once dumped, all of these whiskeys will be sampled by Ari and Adam and bottled at the proof they deem best. One thing we can confirm, these first run very small batch spirits won’t be making their way to retailers this time around. They will be served exclusively at their taproom slated to open summer 2016. 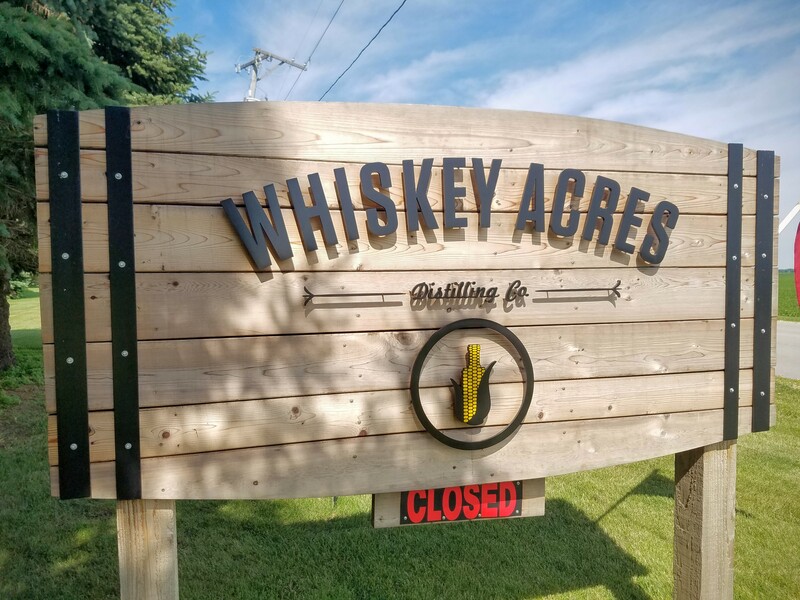 Future plans will likely see their whiskey in Chicago area bars and restaurants. 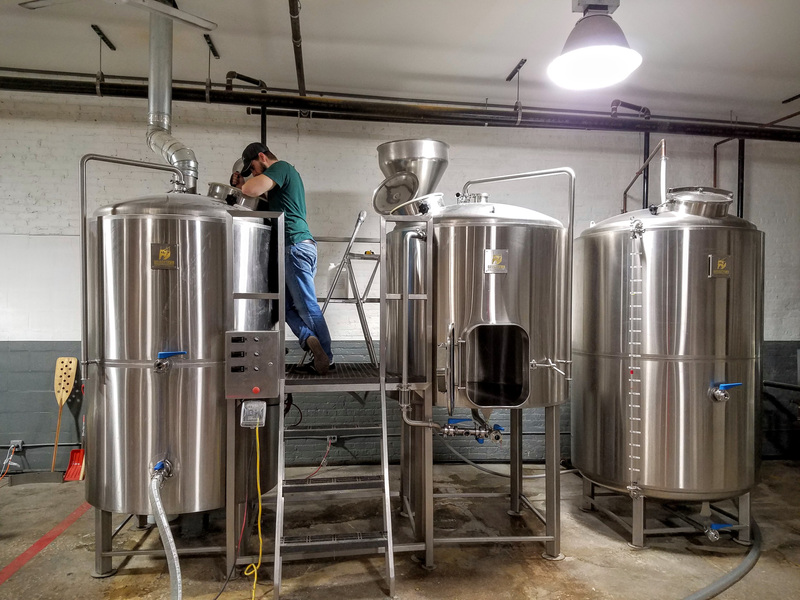 Subscribe to this blog and follow us on social media to be notified when the taproom opens and when they open the brewery/distillery for public tours. What does the future hold for Ari, Adam, and Maplewood? We mentioned the taproom opening in the summer of 2016. There they will be sampling their beers as well as whiskeys, gins, and rum. Ari was excited to tell us about their plans to serve cocktails on tap, both straight and possibly barrel aged. They are considering a sort of ‘whiskey club’ as well. Members may have the opportunity to taste some of their experimental and very small batch creations. Ari shared with us his idea for a bottle tracking program, a concept at this stage. 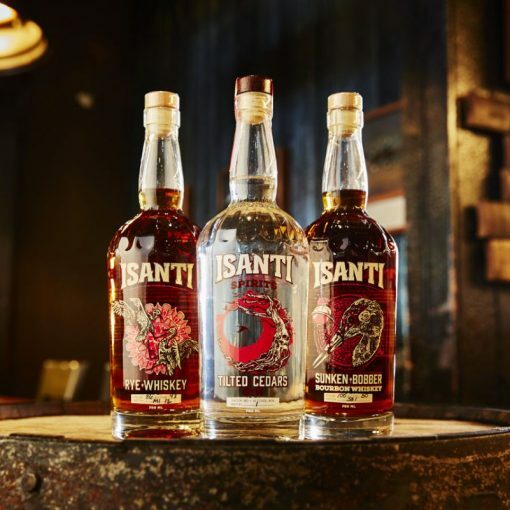 If it comes to fruition the plan would be a serial number on each bottle that could be entered on their website to show buyers detailed information including barrel fill strength, barreling date, dump date and more. We think this is an awesome idea that would be well received by the whiskey enthusiast community. Anything to include the consumer in the process is a win in our book. New charred oak barrels filled with whiskey! Today you can grab one of their delicious beers at a ton of bars, restaurants, and liquor stores in and around Chicago. Check their website here for the complete list. 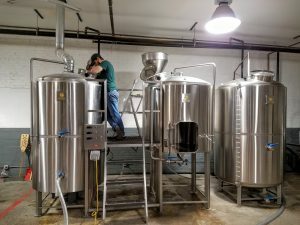 And keep your eyes here for an announcement when they open the Maplewood Taproom and begin serving their spirits and tap cocktails!